Tim Gajser delivered two measured and smart races today to finish second overall at the MXGP of Czech Republic, with a pair of second places in the two motos. 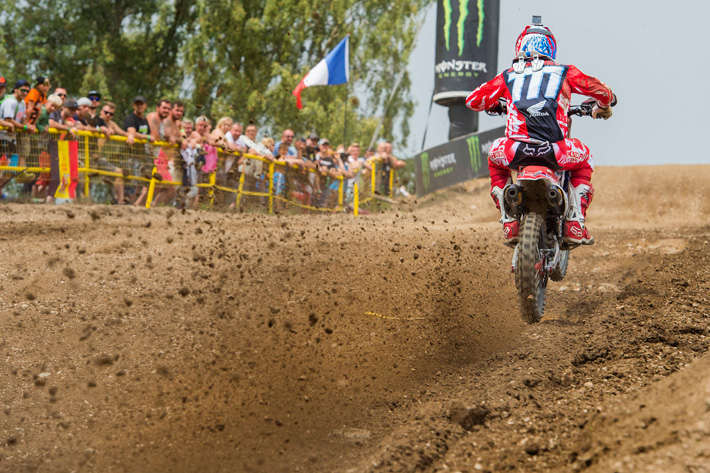 The day was a battle between Gajser and Max Nagl, as the two led the field in both races. In race one, Nagl took the early lead but Gajser was in hot pursuit, as the two were separated by barely one second for most of the race. After an all-out assault for the lead in the closing laps, Gajser sensibly played the long game and settled for second and 22 championship points. In race two, the order was reversed as Gajser took the holeshot and sped to a five second lead, he and Nagl trading fastest laps. As rain fell during the race, the track conditions changed and, five laps from the end, GT243 made a small mistake and crashed, allowing Nagl past. Remounting and giving chase, Gajser cut the gap to just one second, but again after pushing so hard in the tricky conditions, decided to settle for another healthy haul of 22 points. With five rounds remaining, Gajser now sits 109 points clear of second-placed Antonio Cairoli, who in turn is 16 points ahead of third-placed Nagl. The day did not go to plan however for Jorge Zaragoza, who on the second lap of the opening race crashed from ninth position on a fast downhill double, landing on the bike of Pauls Jonass who had crashed from the head of the pack. In the impact he dislocated his right shoulder and was immediately taken to hospital with an additional suspected fracture. Fortunately the arm is not fractured and so the shoulder was repositioned, and Jorge will immediately return to Spain. He will miss the MXGP of Belgium next week, where a further update on his condition will be provided.